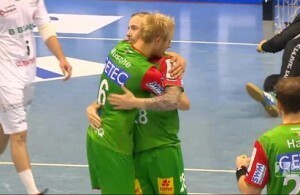 Tobias Karlsson decided to be remembered as the first promo-face of LGBT population in handball world. The 36-years old SG Flensburg Handewitt captain will play his last season in Salming shoes in “rainbow” design. – I’ve been thinking about it since I was banned from using a colored headband. This is my last season and I want to show that I did not give up. I can not understand why they do not agree to promote such values. My shoes are not available for sale, they have been made for me, maybe I will put them on the internet auction and funds for charities – Karlsson said in statement.